We will pay for this one way or another. We will pay to reduce greenhouse-gas emissions today, and we’ll have to take an economic hit of some kind. Or we will pay the price later in military terms. And that will involve human lives. One of the strengths of Dyer’s book (the second book with this same title that I’ve recently read) is that he offers scenarios set at various dates in the twentieth century that illustrate the kinds of conflicts that would occur. Another is the clear, bold way it’s written, interspersed with interview material that is woven into the overall narrative. It is a fairly grim read but a very engaging one nevertheless. Dyer makes a number of arresting points. One of these is that as conflict increases, the chances of collective global action to address the underlying cause will dwindle to zero. Another is that climate change is itself only one of a series of global challenges that lie ahead of us for the forseeable future: the size of the human population, and its expectations, are pushing the planet’s resources to their limits, and there’s no longer any slack. 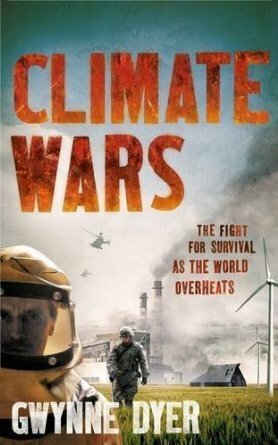 Dyer’s concluding message, one that he knows is controversial, is that we aren’t going to be able to cut carbon emissions in time – we’ve simply left it too late – and that, in the short term at least, there are going to have to be some technical fixes which will either extract carbon dioxide from the atmosphere, or reduce the amount of sunlight reaching the surface of the Earth. There are two reasons why this is controversial. One is that it involves tinkering with some very fundamental things that we don’t fully understand. (Dyer’s answer is that it’s a bit late to start worrying about that now. We’ve already tinkered massively, and we’ve long since passed the point where we can simply hand the controls of spaceship Earth back to Mother Nature.) The other is that it presents a moral hazard: as soon as we get a whiff of a technical fix we’ll stop even trying to address the real underlying problem. Dyer acknowledges this danger – he’s already argued earlier in the book that human beings always push things to their limits – but what he seems to be saying is that, if we want to avoid the tipping point where negative feedback loops will send global warming spiralling upwards, we really don’t have much choice.